The Old Foodie: Human Cuisine. 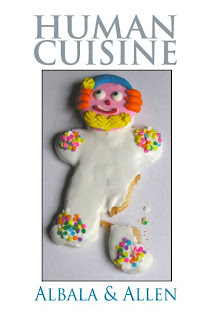 I am delighted to announce that the long-awaited (by the editors and contributors that is) anthology on the topic of Cannibalism (which we prefer to call Human Cuisine) is now available. The editors are the illustrious pair - Ken Albala and Gary Allen, and one of the contributors is yours truly. My own contribution (modest down-cast glance here) has a medical spin, and is called The Human Remedy. You can read about Human Cuisine HERE. Even better, you can order Human Cuisine HERE. As the very insightful Gary Allen says "A couple of strategically-placed copies, at your next dinner party, are bound to provide hours of fun at your guest's expense." A good gift idea for the cookbook addict who has everything perhaps? The last king of America.